Equipped with Samsung’s PurColor that helps images become more vivid and more than a billion colors on-screen for an unmatched picture display, Samsung’s 55″ UHD 4K Curved Smart TV NU7300 Series 7 TV is a gorgeous television. It comes with HDR 10+ support that brings visuals to life. It is the most advanced HDR technology available currently that optimizes every picture on the screen frame to frame to offer you a sensible and remarkable HDR expression. 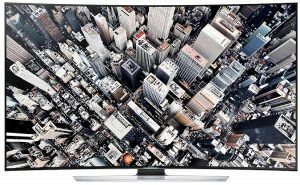 If you want an incredible picture and dramatic detail with UHD along with a 4K resolution, choose the 55″ Class NU7300 Curved 4K UHD TV. You can connect a keyboard with all your apps being available when you type in, plus there are Bluetooth speakers to blast an action movie or headphones for a private screening. Motion Rate 120 makes sports and fast-moving content smooth, and crisp even in the fastest scenes. Samsung has introduced some picture quality enhancements in 55” TVs with some additional features such as Triple Black Technology that is known for the best black color reproduction and HDR 1000, which is known to offer unmatched contrast and sharpness apart from a vivid picture to offer a Hollywood-like experience right at your home in these hip models. 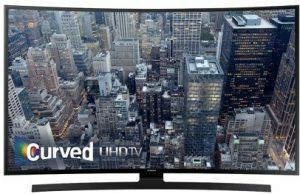 The Samsung Curved 55-Inch 4K Ultra HD 240Hz Smart LED TV contains some very tricky features, such as the UHD dimming option for sharper contrast and the Wide Color Enhancer plus for unmatched and sharp color tones. The faster motion rate of 240 helps the TV offer image refreshment that looks like they’ll fly across the screen in real-time. That means you get high-resolution visuals without needing to adjust the features frequently. This is a very interactive TV. The option to watch four screens at once with the in-built quad-core processor for an unmatched choice to look for your favorite media helps you choose the best option among multiple programs. Just enjoy the best of shows whenever you want without having to move from your couch. The TV also allows easy streaming, and video mirroring in order to provide the best experiences when you want to play content from sites other than the TV channels. It also has a Smart Hub to reorganize the panels into five favorites with access to media in real time. Overall, this is a great option if you are looking for a mid-range size with outperformance at its core. Sound options may be an issue. This Samsung Curved 55-Inch TV is one of the most desirable curved TVs with a LED backlight, a picturesque curved sound bar, and built-in Wi-Fi. The sound bar is capable to sync with media via both Bluetooth and Wi-Fi connectivity so that one can sync with the external devices easily. It also has a plug and plays option using three USB ports or the four HDMI ports to make the experience more convenient and less physically intensive. The TV allows seamless play of one’s favorite content from all online sources at just a press of a button. The UHD 4k TV offers features such as deep contrasts and color enhancements to offer one of the best picture qualities on a widescreen and curved plane to let one feel a part of the story going on in a popular soap opera on the TV. 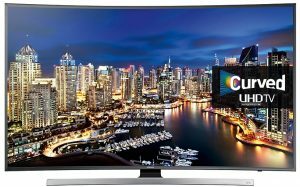 Samsung 49-inch Class KU6500 curved 4K Ultra HD Smart LED TV is one of the best-curved TVs currently available in the market. The price may seem to be on the higher end, but this TV will never let you down if you are looking for an unmatched viewing experience that only comes with perfection. The TV has a palpable high contrast and great black color reproduction which makes it the best option in dark rooms. The availability of high-dynamic range (HDR) image option in the TV set offers notable depth and color reproduction. In other smart features, the TV contains WiFi and Samsung’s built-in Smart Hub for access to live TV. The TV is ready to play content from the streaming sites such as Netflix, Amazon Video, Hulu and YouTube. 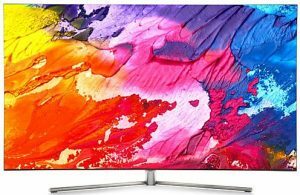 This Samsung TV also offers an upscaling option in terms of picture engine for upgrading old video programs to a near ultra-high-definition (UHD) for a detailed and optimized viewing experience. The 49-Inch Class KU6500 Curved 4K UHD TV offers overall outstanding images with its wide-view angles. The 4K TV is, without a doubt, a much better option than the pricey flat TVs that fail to offer the in-depth immersive-ness available on this curved monitor. Light sources may be reflected on screen. The Samsung Curved 48-Inch 4K Ultra HD 3D Smart LED TV packs some of the most impressive arrays of features. The 48 inch TV is equipped with lots of picture-enhancing features, such as UHD dimming, the 4K UHD, and a very sensitive and highly responsive auto-depth enhancer to provide a very rich picture quality that is available only with Samsung in this range of sizes. This versatility of the nice-looking TV becomes apparent with four HDMI and 3 USB ports. The 4K Ultra HD 3D Smart LED TV also has a built-in Wi-Fi and a Smart View 2.0 that helps one to have non-messy mobile streaming. Meanwhile, the Smart Remote that comes with a built-in mouse pointer helps one to control the TV having a cursor on the screen, or using voice commands for easy and errorless control of the TV features. It is a very user-friendly option that can make TV-viewing a charming matter for the entire family. With options to connect with external content via multiple HDMI and USB ports, this 4K Ultra HD 3D Smart LED TV has an excellent syncing option for people who want to watch content from sources other than the TV channels. It also connects to a Samsung Galaxy phone to offer great compatibility that is beyond just magnificent. Other notable features of the Samsung Curved 65-Inch TV include Peak Illuminator and Precision Black Technology. These options offer a greater image contrast and high picture quality for color and black images respectively. That’s a plus point of the TV which also comes with a UHD upscaling feature to instill life in older video contents. Views may not work well in brighter environments. 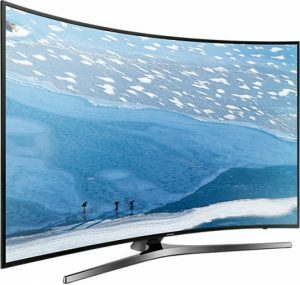 The Samsung 65 Inch Curved 4K Ultra HD 2160p 60Hz LED Smart HDTV is the best combination of price, features, size, and quality. It has a curved 65-inch Ultra HD 4K smart LED display that offers a pleasurable cinematic experience right at your home. The Smart TV comes with options such as picture-boosting with PurColor and UHD dimming, to help make the TV-viewing experience utterly exciting and dynamic. The TV has a 3840 x 2160 4K resolution that makes sure the quality of the images remains as beautiful as is possible with a resolution of four times that of a Full HD television. The other Smart functionalities include wireless connectivity with the Samsung Galaxy smartphone for streaming, playing and content sharing from all external and digital devices. In one word, you can transform from the TV to the web without having to take too long a time. It’s simply heart-warming to the best. The TV also has an intuitive remote control and there are plenty of live TV options. The Smart HDTV also offers video on demand, content display from streaming sources, some new and additional apps, and social media connectivity options in an easy and handy manner. 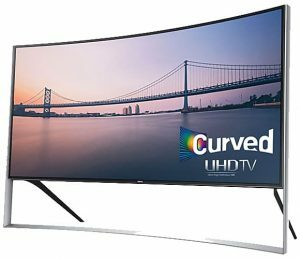 If you are looking to experience the Curved TV experience at its best, this TV is your best option to get the best deal in the most delicate manner now. May feel complicated to control at first. This web-enabled Monitor that also acts like a TV comes with 4K resolution (3840 x 2160) and Windows 10 to let you experience a compact monitor to work as a makeshift TV when you need. You not only get complete control of the TV by using a keyboard, but you can also stream online content without having to be too technical at all. This TV also lets you connect to a wide variety of external media, and play them in a computer-like screen. In one word, the most ‘handy’ TV screen that can double up as a PC monitor as well. You won’t need to juggle between multiple devices anymore to watch your favorite shows. 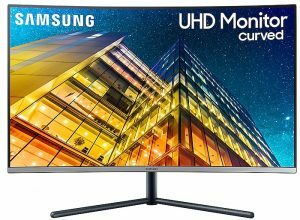 Samsung 32″ UR59C Curved 4K UHD Monitor TV lets you hop from the normal TV mode to the online Netflix streaming with just a press of a button. There are options to browse and edit files from a USB or hard drive too. The ConnectShare feature will let you plug in your favorite movies, music audios, and videos, and image files to be displayed and watched on the compact screen. The TV comes with 4x more pixels than Full HD resolution that displays every image in crystal clear format– starting from action movies and going to the penultimate to watch sporting events, you can get a completely clear view without having to do anything special. Additionally, the Dolby Digital Plus Speakers will help you to obtain maximum pleasure out of the completely immersive experience. If you need to update your social media posts or watch your friends live on Facebook, or to find a mind-charming clip on YouTube, or to go online for some quick shopping, you can do everything without needing to move an inch. The TV comes with a never-ending list of online features, and the powerful quad-core processor makes sure you can have all of these perfectly smoothly, even if you keep switching between multiple modes. Large size; may need planning to set up. 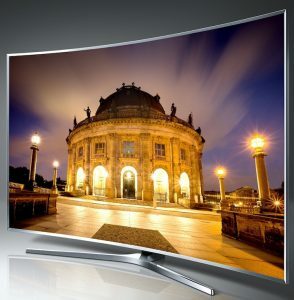 Samsung Curved 88-Inch 4K Ultra HD Smart LED TV is a top of the line Samsung TV that offers many high-end features. The Nano-crystal panel technology offers a brighter, bolder color and immersive picture experience that will take your TV viewing experience to the next level. Moreover, it is a 4K UHD TV, which means you can have a panoramic experience with the life-like visuals on the screen. The Multi-Zone array backlighting technology that has been included very recently helps you to expand and control the TV screen’s brightness levels across the entire 88-inch screen. Meanwhile, having a large screen of 88 inches means that it is more or less like a movie screen, and the high refresh and motion rates make it a TV that can offer you a movieplex like experience without having to travel to the multiplex. The price tag is perfectly proportional to the quality and size of this TV that is a great option for people who like BIG screens. Too large for small rooms. Samsung Curved 105-Inch 4K Ultra HD 3D Smart LED TV stretches over eight feet, meaning you are not just viewing a TV but actually enjoying a huge, movieplex-like screen that is nothing less than a soul-charmer at its minimum. The 105-Inch HD 3D TV comes with an Ultra 4K High Definition to deliver such realistic images that most people who have bought it say that they felt like they were actually having a tour amid the images portrayed beautifully on a gigantic screen. 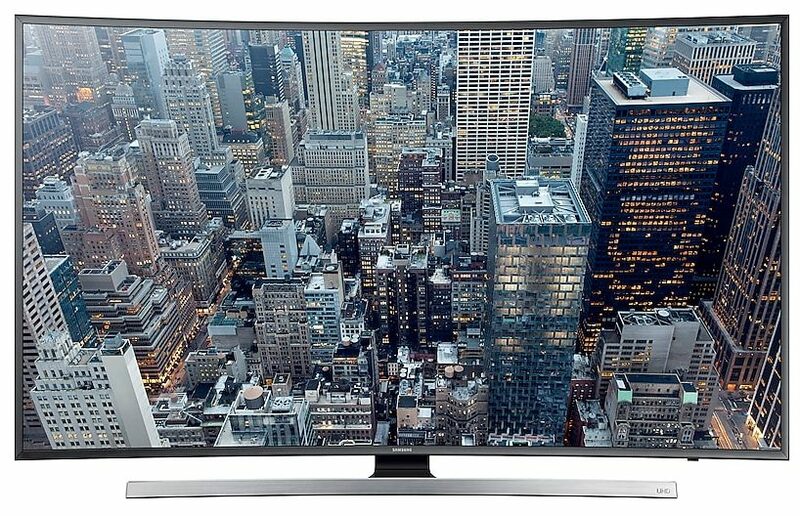 Being Samsung’s largest curved TV with UHD does not make it any less effective when it comes to performance. The 4K Ultra HD does not let it drop a minute detail in sharpness or contrast even when the TV is so huge that you will actually have to plan to set it in your living room. 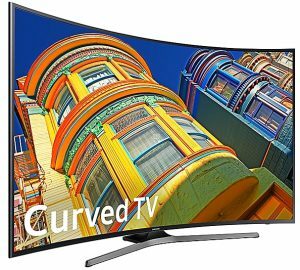 To understand all the options Samsung has for you when you want to get a curved TV for a better and more immersive feel, try doing some research on other Samsung models that are available in the market. You will never feel disappointed with Samsung’s variety of offers in the Curved TV domains.